Cardinal William Joseph Levada’s upcoming retirement leaves a powerful office open in the Vatican. The incumbent prefect of the Congregation for the Doctrine of the Faith is due to retire. Who will replace him? It's probably the second-most powerful Vatican office—prefect of the Congregation for the Doctrine of the Faith, the head of the Vatican department historically known as the Office of the Holy Inquisition. It's the job that Pope Benedict held as Cardinal Ratzinger directly answerable to John Paul ii during the latter's papacy. Under his rule, the prefect became known as "the pope's enforcer." 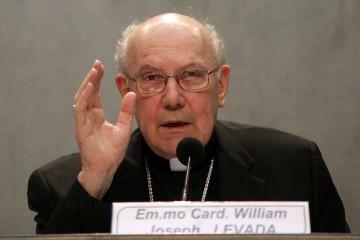 Now the current holder of that office, Cardinal Levada, who was certainly not cast in the mold of a true "enforcer," is set to retire. The question is, who will replace him? In all probability, Benedict appointed the American Levada very deliberately knowing that such an appointment was a gap filler, while he prepared to place a man after his own persuasion, a true doctrinaire "enforcer," in that key role. After all, the prefect of the Congregation for the Doctrine of the Faith is described by those in the know as "the most delicate department head of the Roman Curia, a task Ratzinger held for 24 years before being elected pope" (Vatican Insider, August 25). In our view, there are two prime contenders for that role who fit this moment in the development of Pope Benedict's upcoming great crusade which demands an appointee of the caliber of a Ratzinger to finish off the job of whipping the Curia and general priesthood into shape in preparation for the task. Both are German. Cardinal Christoph Schönborn of Vienna has often been mentioned as a contender for Cardinal Levada's replacement. He currently serves as archbishop of Vienna and is president of the Austrian Bishops Conference. Akin to Benedict, he is an intellectual, a theologian who studied directly under Cardinal Ratzinger. He is also the principal editor of the Catechism of the Catholic Church, the implementation of which the prefect of the Congregation for the Doctrine of the Faith will be charged with overseeing, and enforcing. The other contender hails from Pope Benedict's old college town of Regensburg, Bavaria. He is Cardinal Gerhardt Ludwig Muller, who was appointed bishop of Regensburg in 2002. In addition to being the seat of Benedict's alma mater, it is also the diocese where the pope's brother Georg Ratzinger lives. Muller was appointed a member of the Congregation for the Doctrine of the Faith for a five-year tenure in 2007 and is also a member of the Pontifical Council for Culture. The appointment to this "most delicate department" of a cardinal with Regensburg attached to his résumé could send a whiff of papal grapeshot over the bows of the pan-Islamists who still chafe at memories of the speech Benedict gave from that city, quoting the words of a sage who opined that no good had come out of Mohammad's writings. Either way, unlike Cardinal Levada, each of these men are of an age that would give longevity to their appointment and are each of a truly conservative Teutonic Catholic orientation to the extent that they could certainly play the role of the pope's enforcer in a most crucial time in the European Union's history. We shall be watching very carefully to see who will ultimately be appointed by Pope Benedict to that vital role of "the pope's enforcer."